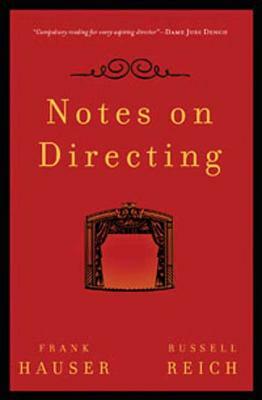 Notes on Directing: 130 Lessons in Leadership from the Director's Chair (Performance Books) (Paperback) | The Drama Book Shop, Inc.
Five years ago, Frank Hauser, then a retired freelance director, and writer Russell Reich, his former student, self-published Notes on Directing in hardcover. It was immediately acclaimed as "a gem-witty and full of insight;" "so sensible, so complete, and so right;" and "amazingly illuminating" by the likes of Judi Dench, Edward Albee, and Terry Teachout. Gathered over Hauser's long career, and polished to a sharp edge by Reich, the 130 "Notes" address a wide range of topics, from "understanding the script" and "defining the director's role" to casting, how to handle a first read-through of a script, rules for rehearsal, how to talk to actors, how to get a laugh, and the key elements of staging. Filled with enduring good advice expressed in assertive, no-nonsense language, and supported with explanatory commentary, insightful quotes and examples, and five valuable appendices, this deceptively slim book has the impact of a privileged apprenticeship to a great master, providing deep insight into the hidden process of creating a live, shared experience. It can be appreciated by everyone from the student aspiring to a directing career to the professional looking for new ideas to the theater-lover wanting insight into the creative process. Indeed, Notes on Directing offers life lessons to all who read it. Frank Hauser, now deceased, formed the Meadow Players at Oxford University in 1956 and served as Director of Productions at the Oxford Playhouse for seventeen years, during which many of his productions were seen in London and New York. In 1968 he received the award of Commander of the British Empire (C.B.E. ), one of the most prestigious honors granted by the Queen. Russell Reich is a creative director and lives in New York. He served as Visiting Artist in Residence at Harvard University, Artistic Associate at the Circle Repertory Company in New York, and was a member of the Circle Rep Director's Lab.